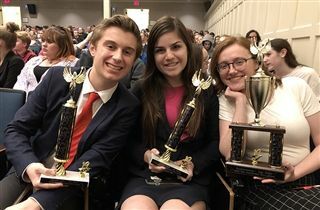 The KCD Upper School Speech Team capped a mighty season by earning a trophy as a School of Excellence in speaking events at the state tournament held at UK over March 15–16. In addition, Caroline Topham took 2nd place in Broadcasting, while Nicole White and Will Tway took 4th in Improvisational Duo. Graesyn Heimer advanced to quarterfinals in Broadcasting, and Will Tway advanced to semifinals in Dramatic Interpretation. All in all, it was a great showing for our Bearcat speakers!